(CNN) -- Everton defenders Tony Hibbert and Joseph Yobo are winning their battles to be fit for their FA Cup semifinal against Manchester United at Wembley next month. 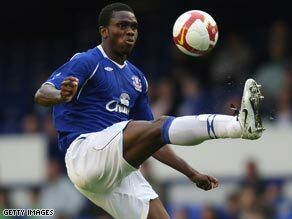 Nigerian defender Yobo looks set to recover from a hamstring injury in time for Everton's FA Cup semifinal. Full-back Hibbert has been out for three weeks with a thigh problem he sustained in the Premier League home win over West Bromwich Albion. Nigerian Yobo, who is expected to open talks over a contract extension before the end of the season, damaged a hamstring in training last week and missed Saturday's defeat at Portsmouth. Both players are expected to be fit in three weeks time, which will coincide with Everton's trip to Wembley to face United for the right to play in their first cup final since 1995. Meanwhile, there is more good news on the Everton injury front with midfielder Tim Cahill certain to be fit for Everton's next match at home to Wigan on April 5. Cahill also missed the Portsmouth clash with a calf injury, but he has flown to Australia this week to link up with the national squad for their World Cup qualifier against Uzbekistan on April 1. Everton physio Mick Rathbone told PA Sport: "Tony's injury was a bad one. He is 23 days into his recovery and we were talking of four to six weeks before he could play again so he is making good progress. "Hopefully he will train towards the middle of next week. Joseph's hamstring injury is not so bad. If there is a good time to injure your hamstring, it is during the international break, I suppose."